Scott, the man behind Archies’ Grobags, is organising a BMX point to point race in July. Sounds like it’s gonna be amazing. I wish I had a BMX. “I’m putting on a point to point race for 20″ wheels only, from Brick lane to Brixton skatepark….ending with a bmx jam at the park, with BBQ, beer, music, and a whole lot of bikes hopefully. 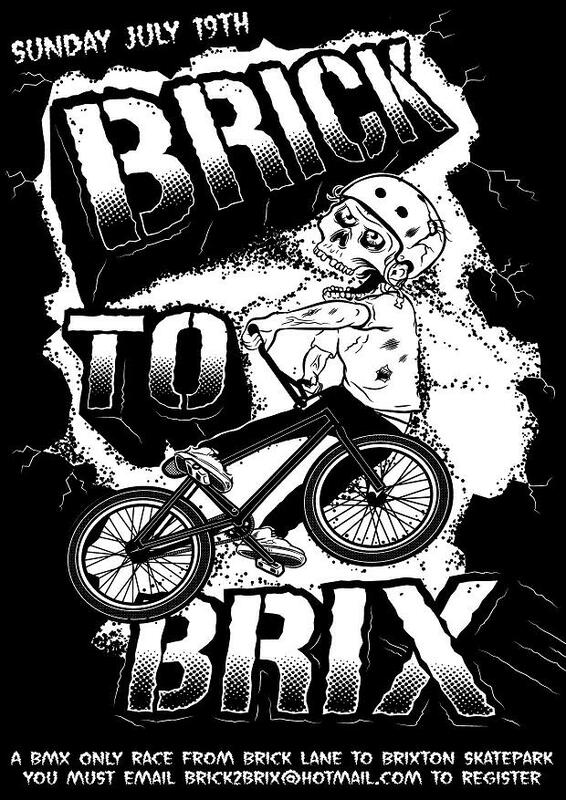 It’ll be the first race of this kind in the uk as most bmx events are either street or dirt based….this will be a flat out sprint through the streets of London…So i hope your legs are up to it? The idea is to cap it at 150 riders….with the first 100 to get to the elephant and castle grabbing a ticket that allows them to race the rest of the way to Brixton skatepark after a little rest and regroup.